Laura Kasinof studied Arabic in college and moved to Yemen a few years laterafter a friend at a late-night party in Washington, DC, recommended the country as a good place to work as a freelance journalist. When she first moved to Sanaa in 2009, she was the only American reporter based in the country. She quickly fell in love with Yemen’s people and culture, in addition to finding herself the star of a local TV soap opera. When antigovernment protests broke out in Yemen, part of the revolts sweeping the Arab world at the time, she contacted the New York Times to see if she could cover the rapidly unfolding events for the newspaper. Laura never planned to be a war correspondent, but found herself in the middle of brutal government attacks on peaceful protesters. As foreign reporters were rounded up and shipped out of the country, Laura managed to elude the authorities but found herself increasingly isolatedand even more determined to report on what she saw. Don’t Be Afraid of the Bullets is a fascinating and important debut by a talented young journalist. Laura Kasinof is a freelance journalist who, at the age of 25, reported from Yemen for the "New York Times" during the Arab Spring protests of 2011. Laura's work has also appeared in the "Washington Monthly," the "Economist" and the "Christian Science Monitor," among other publications. Her first book, "Don't be Afraid of the Bullets," chronicles the highs and lows of her year in Yemen. She lives between Colorado and Washington DC. 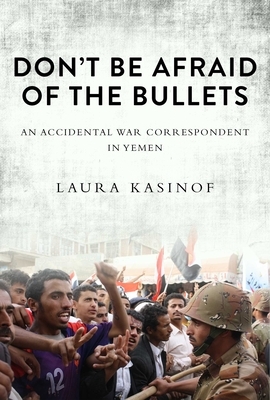 "[Laura Kasinof] provides vivid details of those years, bringing readers into the heat of the conflicts, into the mosques-turned-hospitals filled with the wounded and dying, and into the sitting rooms where she interviewed some of the most important men in Yemen . . . A moving portrait of life as a war correspondent. An action-packed account of the civil war in Yemen from a woman who experienced it firsthand." "This is a beautifully written, highly personal account of a young journalist's experience with revolution and war in Yemen. Kasinof offers a revealing portrait of the lives and work of a rising generation of young journalists at a time of urgent and perplexing changes. She weaves together their stories with a compelling account of Yemen's ambiguous revolution as witnessed by one of the few Western journalists on the ground. It is a gripping, thought-provoking read about how the news is really produced in today's turbulent Middle East." "A fast-paced journey through the Yemeni uprising that began in 2011, by someone who witnessed much of it first hand. Kasinof offers a welcome corrective to the pervasive view of Yemen as an incubator of terrorism and little else, showing the humility, humor, and grace of ordinary Yemenis as they attempt to navigate fiendishly challenging circumstances. "As I was anxiously watching the political situation in Yemen unravel and become more dangerous in the years leading up to its Arab Spring, there was one reporter whom I read with interest and confidence, and that was Laura Kasinof. She clearly knew Arabic well, was familiar with the local scene, and talked to more than the 'usual suspects' when she wrote up her columns. To produce that kind of nuanced reporting required a person of tenacity and ingenuity, a true force of personality. This memoir provides us with a fascinating glimpse into both those turbulent years and the kind of fearless reporting it took to render them intelligible."